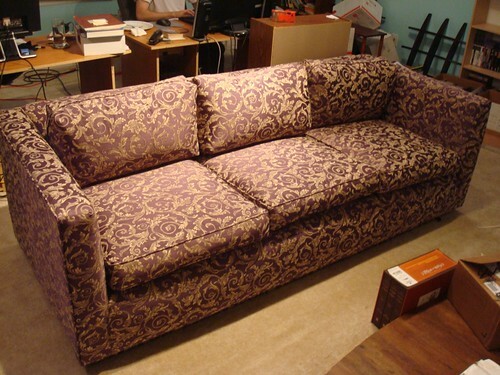 Today the upholsterer dropped off our completely made over couch. He told my husband that it was the most rework he'd ever done on a couch--he'd gutted everything but the frame. What can I say? It's a special couch. My parent's custom ordered this couch (the tall people special!) when I was a tiny tot. It was covered in brown velour with textured stripes. After about a decade my mother went officially insane and, with two kids still at home, had it recovered in a white weave. By the time I was heading off to college it was in pretty sad shape. A family friend picked up some black and white, leopard print and striped fabric (yes, you read that right) and my mother and I recovered it for my first apartment. Eight years later the hubby and I were looking for something a bit more...sophisticated. So, as you will remember my mom and I opted to tackle the job again with less success. Which is where super upholsterer came into the picture and returned to us this beauty. It's so soft and squishy and comfortable that I never want to leave it ever again. It's even rivaling my bed. Which is saying a lot. OMG I remember that couch being leopard/zebra grey white in our apartment. It looks fabulous now!